John Deere’s new HPX 815E Gator utility vehicle will be making its public show debut at BTME 2018 in Harrogate next January. This latest diesel powered Gator shares its new styling with the XUV 855M model, which replaces the 855D. The HPX 815E is ruggedly designed for a range of transporting and general materials handling duties in any outdoor environment. Powered by an 18hp 854cc engine working through a two-speed high-low continuously variable transmission, this two-seater vehicle is available with true on-demand four wheel drive and is capable of travelling at speeds of up to 25mph. A simple dash-mounted electronic rocker switch controls an auto-locking front differential for extra traction when needed in challenging conditions, or to maintain two-wheel drive for lighter turf operations, for example. Additional standard features include a 12V DC outlet, all-wheel suspension and steering, front and rear hydraulic disc brakes, a rear diff lock and an integrated four post ROPS canopy with door nets. Based on a heavy duty hydroformed steel frame for increased durability, the HPX 815E provides an increased payload of 635kg and a towing capacity of 590kg, while the updated cargo box has a load capacity of 454kg. Both the sides and the tailgate, which has a pick-up style one-handed latch, can be easily removed to provide a flatbed-style load bay if required. The durable composite construction of this industry leading cargo box makes it dent, rattle and rust-resistant. Additional changes to this model for 2018 include a new digital dashboard, powerful LED headlights and a restyled front bumper, to improve handling and operation particularly in challenging terrain. 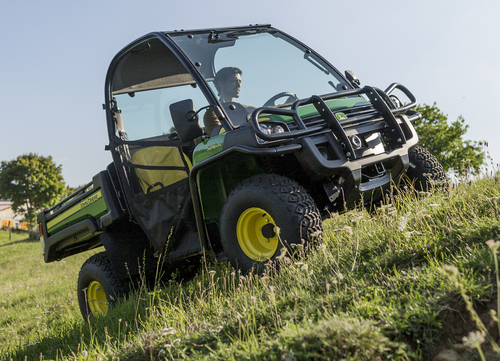 Optional attachments for the new HPX 815E Gator utility vehicle include a road homologation kit, rear hitch, front and rear blades, a winch and a heavy-duty front suspension kit.